This is not so much a book review as a book recommendation. 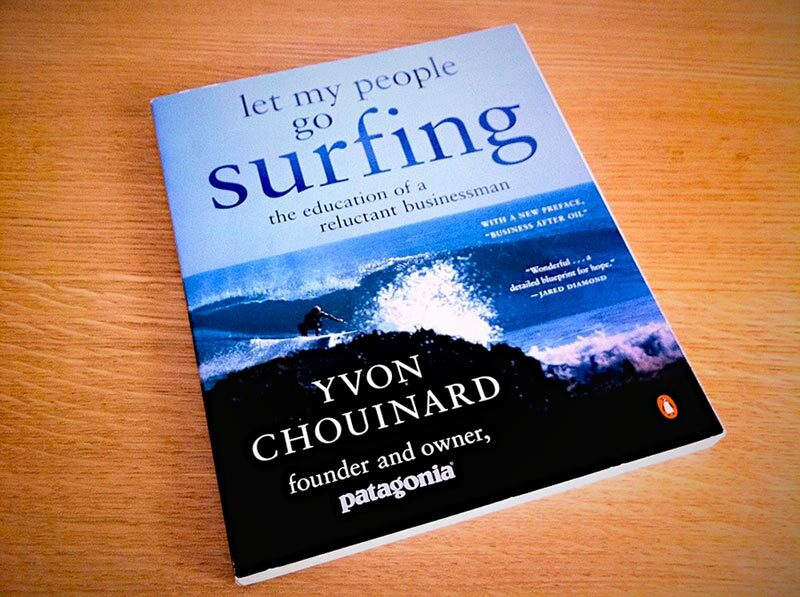 In fact I’m quite happy for you to stop reading this now and to go and buy Let My People Go Surfing by Yvon Chouinard it’s that good. Still here? OK I’ll talk a little about this great book. I bought this book to read about how Patagonia looks after its staff; the whole “let my people go surfing” flexible working philosophy, I didn’t expect to have my outlook on the environment fundamentally altered. The book is divided into two main sections, the first looks at the history of Patagonia and the second the philosophies of the company. The history of Patagonia is very interesting and sets the tone for the future of the company. Yvon wanted to build the best climbing equipment he could and did so. In the process he changed how people climbed – moving them away from destructive pitons and over to less damaging blocks. Over time his company gradually moved into clothing and grew into the Patagonia of today. However it’s the company philosophies that I wanted to learn about. Patagonia has eight stated philosophies ranging from product design to the environmenta. I’ll talk first about the human resources philosophy for that is what brought me to this book. why on earth would anyone run a company that is hard to work for? It’s telling that the environmental philosophy accounts for over a third of the philosophies section. The environment has always been Yvon’s main driver and prime concern and it is this focus on the environment that was the revelation of the book for me. I thought I was fairly environmentally aware and also pretty “green” but clearly I’m not. The environment has only become an issue to the general public in the last few years really but Yvon and Patagonia have been aware of the issues and campaining since the late sixties. Sadly it’s very concerning to read Yvon’s pessimism for the planet – he clearly feels that too much damage has already been done and there is too little movement to alter human behaviour. The very fact that the US refuse the accept global warming as an issue and the Kyoto Agreement as a way to address it beggars belief. I’m not going to go into detail here about Patagonia’s environmental work as I feel it would be much better for you to read it yourself and for you to absorb in your own way. Reading the environmental section of this book was a massive eye-opener for me, possibly compounded by reading it whilst on holiday in Cornwall one of the most lovely parts of the UK, but nonetheless made me question some of my actions and habits and determined to change. The very last section of the book concerns the 1% For the Planet Alliance. Patagonia have always given a percentage of their profits and then sales to environmental causes. To help other like minded companies do the same Yvon helped found the 1% For the Planet Alliance to administer the donations. They now have 859 companies donating 1% of sales; a good number but 859 out of the thousands of companies worldwide is a poor show. Read this book; it will make you question how your company functions,thinks, treats it’s staff and the environment.